Namibia is one of the most unique places on earth. Surreal landscapes tremble with exotic wildlife, ancient indigenous tribes and the beguiling untamed rhythm of southern Africa. Namibia is home to one of the oldest deserts in the world and over 2.5 million people. 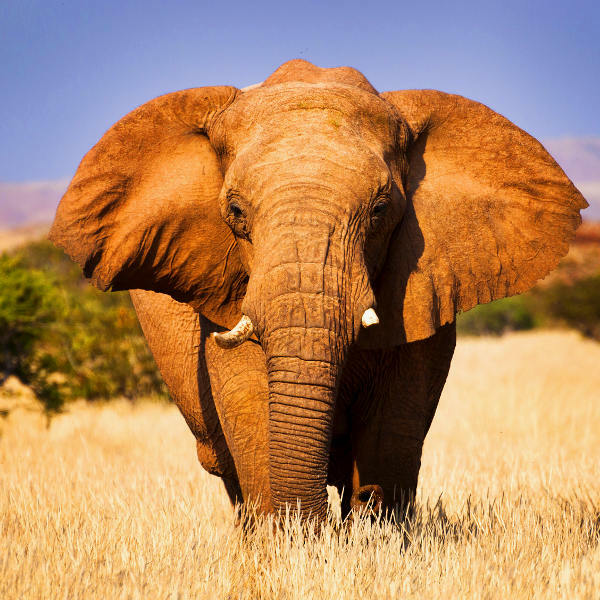 Popular attractions include the Etosha National Park, Skeleton Coast, Sossusvlei and Fish River Canyon. 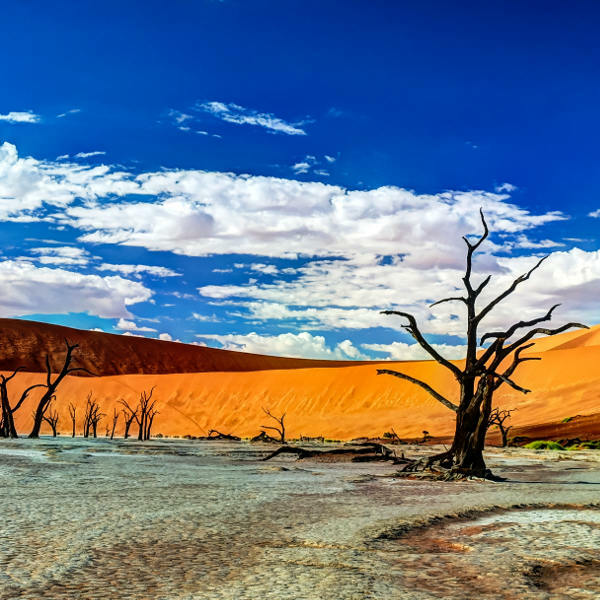 With cheap flights to Namibia you have a chance to be enchanted by the sublime beauty and rugged soul of one of the last great wildernesses in the world. Windhoek is home to Hosea Kutako International Airport (WDH), which is 35-minute drive from the centre of the city. Namibia is a quilt of plunging canyons, magnificent crimson dunes, ghost towns, African savannas that quiver with wildlife, and remarkable coastlines dotted with shipwrecks and enveloped by glittering sapphire ocean. Climb the highest dune in the world, stargaze in Sossusvlei, trek through the Fish River Canyon (the largest canyon in Africa), meet the elusive Himba people, and visit one of the most spectacular wildlife parks in Africa. Track elusive black rhinos in Damaraland, walk with wild cheetahs at Erindi Game Reserve, and watch giraffes, lions and wildebeest prowl through grassland and perennial springs in Etosha National Park. Namibia is one of the sunniest countries in the world. The country experiences an arid climate, with hot days and cold nights. Temperatures can reach 40 degrees Celsius in summer and drop to -1 degrees Celsius in winter (the coastal areas tend to be cooler). The north-eastern areas receive the most rainfall (although rainfall is generally sparse). The best time to visit is during the dry season (mid-April to October). These months offer dreamy weather and excellent game viewing. This is peak season, so accommodation should be booked in advance. The wet season spans November to May. Game viewing is more challenging during these months, but the landscapes blossom beautifully and rates tend to drop. For cheap flights to Namibia, the best time to visit is from December to March and the shoulder seasons of May and November. This excludes the Christmas and New Year period. Namibia is the wild heart of the African wilderness.The country unfolds along the untamed coast of southern Africa, offering surreal landscapes and extraordinary experiences that never cease to awe and inspire. Embark on a safari through Etosha National Park to witness sublime wildlife spectacles and explore the iconic dunes of Sossusvlei and skeletal remains of Deadvlei. Other famous attractions include the Naukluft Mountains, Spitzkoppe and the Ruacana and Epupa waterfalls. Search for ancient rock art in Twyfelfontein and Damaraland, or journey to Kaokoland to learn about the OvaHimba. The towns of Swakopmund, Walvis Bay, and Lüderitz offer incredible seafood and a gateway to adventure. 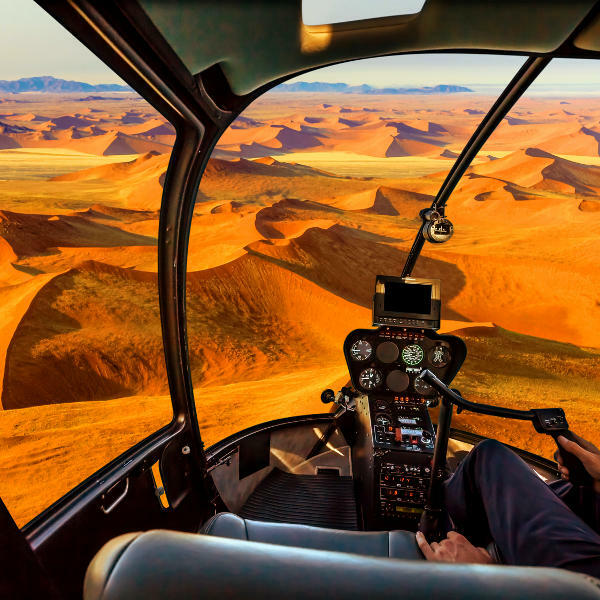 Kite surfing, quad biking and dune boarding will get your blood pumping, while a scenic flight over Skeleton Coast and hot air balloon ride over the dunes are truly unforgettable sights. Be sure to explore Kolmanskop ghost town and go star gazing in Gamsberg. Namibia is one of the great masterpieces of planet earth, and it beckons you to witness its raw, untouched beauty and feel its wild, feverish soul. Compare several airlines and book your cheap flights to Namibia online at Travelstart! Namibia is one of the safest countries in Africa. However, it is still recommended that you take certain precautions and use common sense as you would in any other unfamiliar country. Travel insurance to cover theft and medical expenses is recommended. Avoid carrying large sums of cash, valuables and important documents, as pick-pocketing does happen. Be vigilant when driving outside of the city (especially at night) as wildlife pose a serious hazard. It is recommended that you familiarise yourself with the local laws and customs before arriving. Keep clear of the prohibited Sperrgebiet area en route to Lüderitz. Proof of yellow fever vaccination is required if you are travelling from an infected area. Malaria and other insect-borne diseases are a risk in certain parts of Namibia, so the necessary precautions should be taken to avoid bites. Immunisation against hepatitis A & B, typhoid and rabies is recommended. Routine vaccinations, including MMR, diphtheria-tetanus-pertussis, varicella, polio and influenza should be up to date.